Sparked nice but kinda short discussion, which kinda sad given alot of enthusiasm toward this type of antenna. 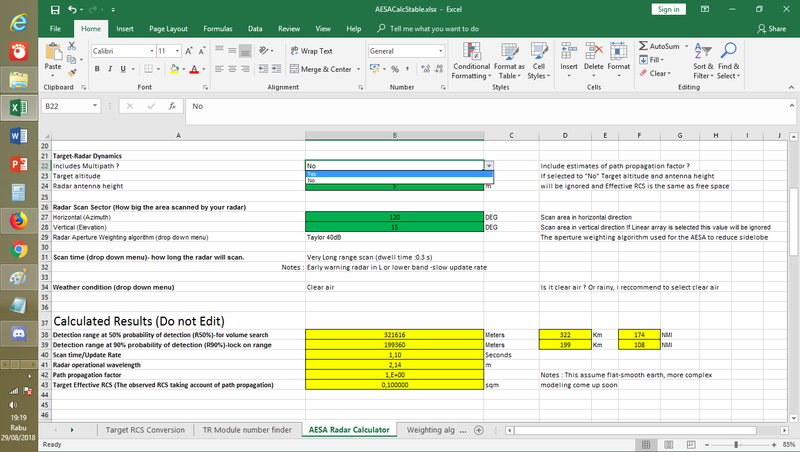 Anyway This simple calculator will help range modeling of 2 types of AESA radar. The planar array which is the one can found in aircraft nose or large AEW aircraft ala A-50EI,JSTARS, Phalcon and SAAB Erieye/Global Eye. And linear array which can be found in NIIP's new radar. The user interface is very simple, as simple as it can get and allow prediction of range in 50% and 90% probability. Ranges where usually volume search and tracking/locking on target is defined. Dwell time for the antenna, basically determine how long it will search the sector. and some attempt to model weather tho this one is likely improper. Derived from simplified K.Barton's model. I recommend to leave it as is as it might cause problem. 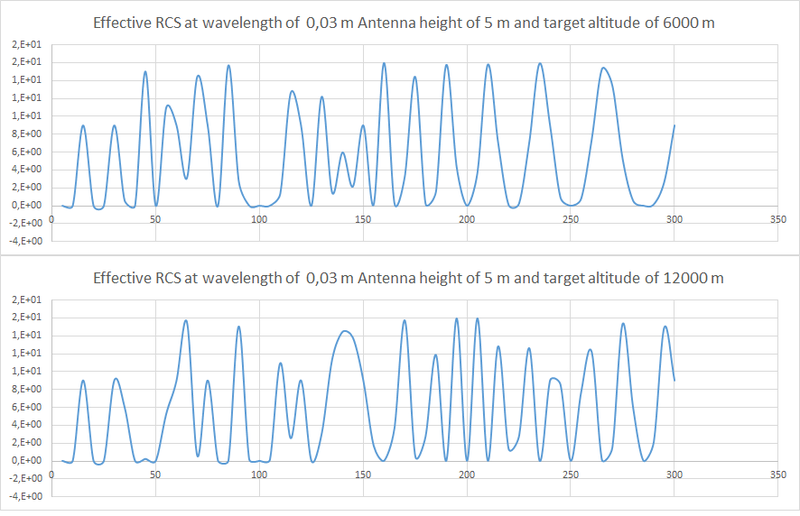 My latest post in the original thread contains some discussion material if one interested or wish to model low RCS target especially to determine what value should be used for frequency other than X-band. This kinda controversial sheet will attempt to approximate/predict RCS of a target and establish a lower and upper limit of its RCS based on Wavelength and Squared wavelength phenomenon. It based on my own observations. So it goes without saying to treat the result carefully and as a first order of approximation. It also include simple calculator to find area of most commonly used antenna. This new antenna is basically same as planar array BUT with take factor of antenna dimension. Provision of this antenna in option is necessary due to the fact not every AESA antenna are regular (box or circle) but like Su-57 N036 Antenna or Chinese KJ-2000 AWACS antenna, they are eliptical and therefore need a separate section. Another update is the replacement of wavelength with frequency, so user only need to input frequency in MHz instead of wavelength. Adding Multipath propagation as factor. The multipath or path propagation factor is kinda rarely discussed in typical open forum. The importance however is paramount that it will directly affect design of the rada and must be considered for performance calculation. The path propagation factor will also affect observed radar cross section of the target. The result is a variable called "Effective RCS". The free space RCS (that is the one not affected by path propagation factor) multiplied by the path propagation factor. The importance of the effective RCS lies in the fact that it's very specific for the type of radar, it's target behavior and the surrounding environment. 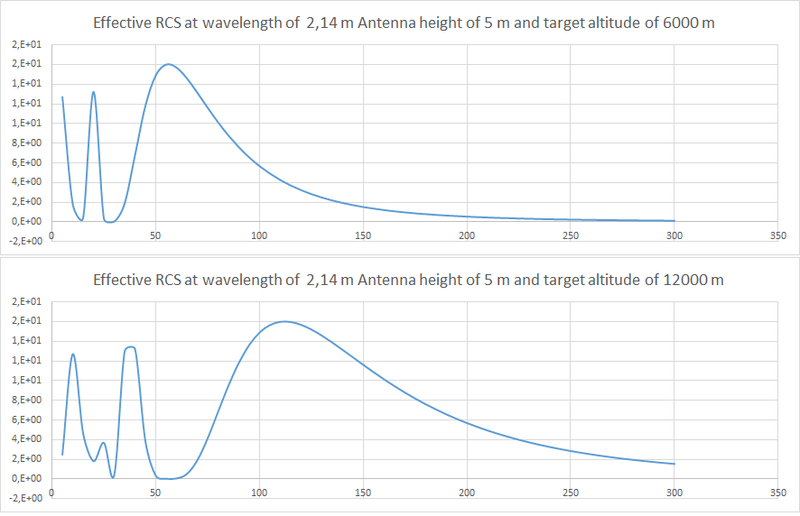 Change in target altitude, radar antenna height will dramatically change the effective RCS, as illustrated below. Notice the change of RCS from range as the target basically "move" from one lobe to the other and also change of altitude. Thus attempt to calculate RCS based on non instrumentation radar like say old discussion in SAM system simulator forum regarding F-117 RCS, must include the path propagation factor. Otherwise the resulting measurement (0.001 sqm in 30 Km) is NOT usable in other form of VHF radar and in other environment. 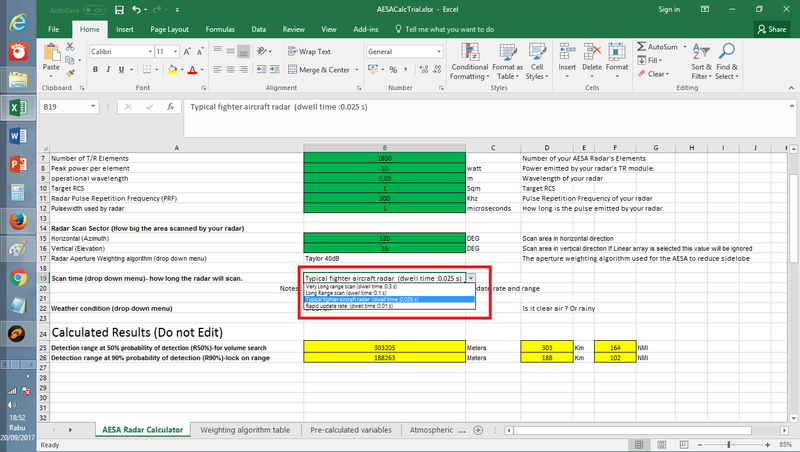 In this AESA radar calculator however the model of the path propagation factor is rather simplified model where it use Flat earth approximation and perfectly smooth and reflective surface. Arguably however this is similar to sea water. 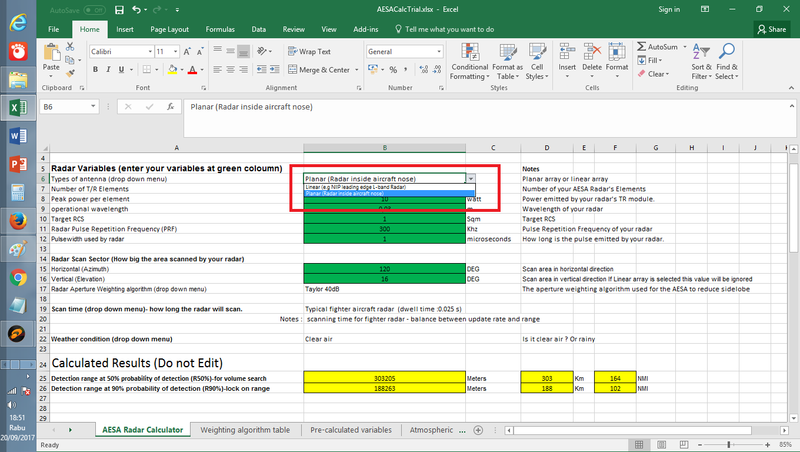 More complex modeling however have to wait until i can solve problem related to implementing antenna radiation pattern in excel. More accurate modeling of path propagation factor requires antenna radiation pattern in elevation to be known. 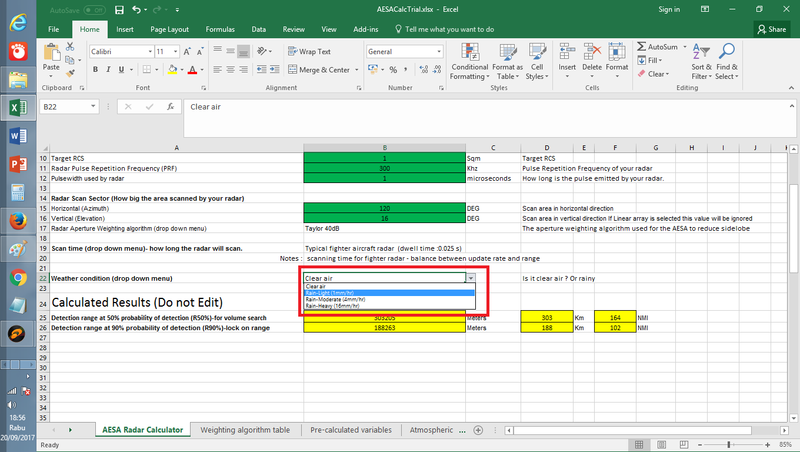 User can enable or disable the calculation of path propagation factor via simple drop down menu. User can then specify the height of the target and height of his radar antenna. The result section now contain not only range but also the calculated path propagation factor and effective RCS.